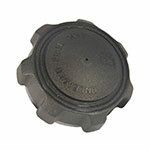 Buy genuine OEM and aftermarket MTD fuel caps for lawn mowers, riding mowers, zero-turn mowers, push lawn mowers, self-propelled lawn mowers, electric mowers, trimmers, edgers, tillers, cultivators, leaf blowers, chippers/shredders, log splitters, and snow throwers. Get fast shipping and low prices from Power Mower Sales! Can't see the specific part you're looking for? Try searching with a part number or model number using our interactive parts lookup.